You couldn’t ask for a better playoff game. Two evenly matched teams in the hunt for the Steinfeld Cup once again. 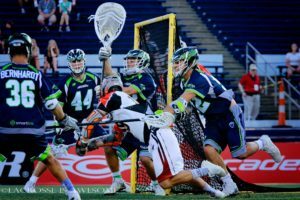 The Chesapeake Bayhawks (9-5) would host the Denver Outlaws (8-6) as the Number Two and Number Three seeds heading into playoff weekend in Major League Lacrosse. In their two previous meetings during the 2018 season, Chesapeake would defeat Denver by two goals. The first in Denver by the score of 24-22 and the second in Chesapeake by the score of 13-11. The Bayhawks have won three Steinfeld Trophy’s and the Outlaws two. Each team has been to the championship game multiple times with Denver winning in both 2014 and 2016. This would be the 23rd meeting of the two teams and their second playoff game. 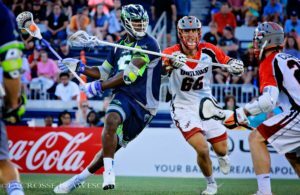 The last time the two teams met on Championship Weekend in 2012, the Bayhawks would defeat the Outlaws by the score of 16-6. There would be no chance for the trophy for Chesapeake in 2018 as Denver would defeat them in a nail-biter by the score of 13-12. The game would start almost 70 minutes late as yet another lightning delay would happen in this illustrious season. Chesapeake would be without their face-off specialists Steve Kelly who went down with an injury the previous week in their contest against the New York Lizards. Denver was without rookie sensation Chris Cloutier who was injured during the game against Dallas on July 22; and Jack Kelly in net who suffered a season ending injury during the 2018 World Lacrosse Championships in Netanya, Israel during the Team USA vs. Team Australia game on Saturday July 14. There were three players on both sides of the field playing in their first ever career playoff game. They included: Kylor Bellistri, Denver Outlaws; Lyle Thompson and Colin Heacock, Chesapeake Bayhawks. The Outlaws were league leaders in goals per game with 16.1/game; Chesapeake led the league in two-pt. goals with 11, while Denver had allowed the most in the league with 14; the Outlaws had a record of 7-1 when leading at the half; and Chesapeake were 1-4 when trailing at the half. At the conclusion of the game, Denver would end up with a record of 8-1 on the season when leading at the half; and Chesapeake was held to zero 2-pt goals. Denver would win the opening face-off with Max Adler who had a FOW% of .577, but the Outlaws didn’t get a shot on goal in their first possession thanks to some great defense by the Bayhawks. On their second possession, Kylor Bellistri (3G, 2A) would score his first career playoff goal at the 2:43 mark off a nice feed from Chase Young drawing the defense and allowing him to put it past Niko Amato in net. After almost five minutes of scoreless lacrosse and spectacular defense, Josh Byrne (2G, 1A) would score on the broken play by the Outlaws with a no angle shot on Ward off the beautiful skip pass from Lyle Thompson. Next up was a “whoops” goal as Dillon Ward attempted the outlet pass and took his eyes off Steele Stanwick (1G) who was standing on the doorstep and as Ward released the shot, Stanwick would reach up snagging the pass and one-handed, dropped it in over Ward’s shoulder. Drew Snider (1G) would tie the game up as he came out of the substitution box, had the momentum and with the muscle dodge blew it past Amato at 2:15 to end the quarter. The Outlaws would attempt one more transition goal off a pass from Zach Currier to Bellistri with 18 seconds in the frame, but failed to capitalize. Score at the end of one: Chesapeake 2—Denver 2. Denver had a commanding lead in stats at the end of 15 leading 10-2 in GB’s; 3-5 on face-offs; and 11-4 in SOG’s. (2G, 1A) would drive in and score at 5:41 unassisted beating Michael Simon timing the check perfectly, jumped and sent a bullet bouncing past Ward. Thompson (4G, 1A) would score his first career playoff goal when Ian Mackay who was wide open sent a cross crease pass to Thompson, who faked right and went left to tie the game. Matt Danowski (1G) would score what was almost a man-up goal on the Tintle holding call. Just as the penalty was released, Byrne would throw the fake, pass to Danowski who used the screen scoring on Ward at 8:27 putting Chesapeake up 5-4. Denver would close out the first half with two more. The first on a man-up opportunity (Denver leads the league 25-29 with a 42.4% PPG). Bellistri would team up with Law (2G, 4A) drawing the defense left allowing Law to score on the doorstep; and Currier would get his second of the game, another step down shot whipping it past Amato with 47.3 seconds left. Up until that time, there had been 10 different goal scorers in the contest. Score at the end of two: Outlaws 6—Bayhawks 5. The Outlaws would continue their run into the third with Currier hitting back-to-back goals. The first unassisted on the power-play (hat-trick) off the goalie interference call against Danowski at 1:51; and the second an absolute beauty. It started with Law shooting on Amato who made the nice save, but as the ball rolled past the net, Currier would scoop the ball, tiptoe the crease and slam dunk it over the head of Amato putting Denver up 8-5. Chesapeake would go on the man-up situation off the goalie interference call on Chase Young at 8:01. Jones would send a cross field pass to Thompson who would swing low scoring on Ward. On the next match up at “X”, CJ Costabile would win the draw and was whistle ready finding his open man passing to Jesse Bernhardt, who sent the blitz shot to Byrne for his second on the evening. The two goal run put a fire under the Bayhawks as they were executing at a much higher level than in the first half. Ward then kicked it in high gear as he stopped three successive bullets on net saving yet another goal. On the next play, Ward read the offense well as Chesapeake made an extra pass to the cutter and would stop the shot at 2:50. But Thompson wasn’t done yet. Matt Bocklet would head up the field and Thompson would cause the turnover and headed to the net all alone, faking left then right and the shot hit Ward in the arm going into the net giving him the hat-trick and tying the game. Bellistri wasn’t done yet as he’d score his hat-trick with 1:23 left on the clock on a transition from Tintle who got the ball out of the defensive zone and with a quick stick passed to Bellistri whose momentum took him past Chris Pannell for the goal. Score at the end of the three: Denver 9—Chesapeake 8. With it all on the line in 2018, the teams headed into the final frame. Law would hit a nice behind-the-back shot off the feed from Bellistri fooling Pannell with the trickery only 43 seconds in. The Bayhawks got fired up again knowing the end of the season could be less than 15 minutes away. They would go on their third three-goal run. Colin Heacock (2G) who was silenced in the first 45 would get a nice pick from Mackay, and set the screen for the high to high heat scoring his first career playoff goal at 1:08. Jones would tie the game at 10 apiece as he kept the heat on his defender fooling Snider who was looking up field allowing an opening on net for the score. The Bayhawks defense held the Outlaws for the full 60 allowing Thompson to finish it off on transition with his fourth on the night giving them the lead 11-10. Denver would get their next extra man opportunity off the push from Byrne on Bocklet at the midfield line. This allowed Law to feed the ball to Kavanagh who was wide open. Law would drag across the backside pulling the defense right leaving Kavanagh wide open and scoring at 6:41 to tie the game at 11. On the next possession, Law would shoot on net and Bellistri was in the right place at the right time gaining possession. He came around the crease, wrapped around the net and snuck the ball in on the far side of the post. The next goal by Heacock was all power as he fought off two defenders, muscled in and sent the shot past two defenseman tying the game at 12-12. 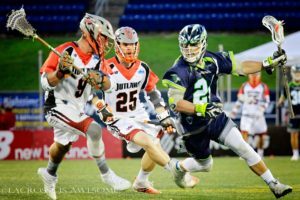 About two and a half minutes later, Schlosser would use his speed as he headed down the field taking advantage of the Bayhawks on transition, passing to Kavanagh for his second of the game at 11:07 and what turned out to be the final goal of the game. Denver mixed up their offense in the last two minutes, putting the long poles on Heacock hoping to eliminate the two-point goal, and the short stick on Stanwick. The move worked as Heacock was kept at bay. As the clock wound down on the second to last possession for the Bayhawks and with one second on the shot clock, 35.8 on the game clock, Ward would make the save of the season as he denied the goal on Jones with a beautiful kick save. Chesapeake wasted a lot of time passing the ball around, but would still be on another man-up opportunity at 4.5 seconds on the game clock. Thompson would bring the ball into play, with Finn Sullivan defending the pass. Thompson would make a high pass from behind the crease over the head of his teammate as the clock ticked down to zero. Final Score: Denver 13—Chesapeake 12. In the first, third and fourth quarters, goals would be equal; except for the second with Denver outscoring Chesapeake 4-3 and that would turn out to be the difference. With the win, Denver heads to their third consecutive championship game and a league leading championship playoff appearance with eight. Denver will face the Dallas Rattlers on August 18, 2018 in South Carolina as the Rattlers would defeat the New York Lizards by the score of 15-12. The Rattlers have defeated the Outlaws in both contests in 2018. Can Denver turn it around like they did with Chesapeake?